Drop a dress or shirt size and learn how to regain control of what - and how - you’re eating. My next 21 Day Nordic Energy Plan will be starting in the New Year! Book your place now for just £67 or contact me to find out more. My 21 Day Nordic Energy Plan is based on the latest guidelines for healthy, sustainable living across Europe, and more than 8 years of experience I’ve had working with clients who want to lose weight and feel great. It’s also designed to teach you about a new way of eating and thinking about food so that you can sustain these changes in the longer term. 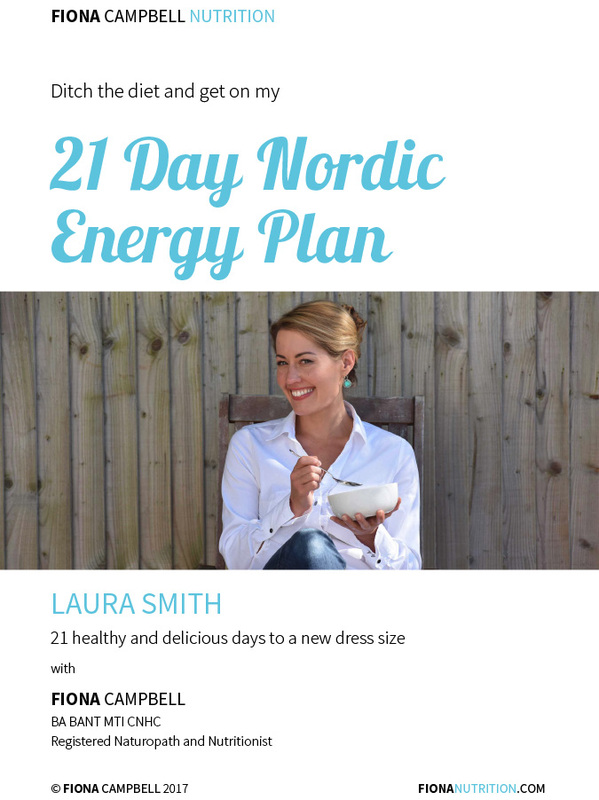 Inside my 21 Day Nordic Energy Plan, you'll find a tasty selection of Nordic inspired recipes and handy shopping lists to make eating healthy simple and easy. You’ll enjoy locally produced, seasonal, natural food and high quality ingredients which are packed with nutrients. The ingredients not only taste great; they will make you look and feel amazing, and the recipes can be enjoyed by the whole family. You'll save money, support your local economy and reduce your impact on the environment. You'll also be able to enjoy treats such as wine, cake and ice cream, so you won't feel deprived! Remember - the plan isn’t just for 21 days – it’s designed to help you sustain these changes for good. It's time to ditch the diets and learn how to make positive changes for good! Sign up now and join my first 2018 Plan - date TBC! Complete the form below to book your place on the upcoming Nordic Energy Plan and pay via Stripe. Your plan will be sent to you via email shortly after payment has been made. By completing the form below and placing an order you are agreeing to the terms and conditions below. These are the Terms of Business which govern our sales of nutrition plans (Plan(s)). This constitutes a legal agreement between us and you. Please read it carefully. Please note that we do not provide medical advice. When following our Plans you are doing so at your own risk, and you must take full responsibility for the effects on your body that you may experience along the way. Any guidance we may provide is no substitute for professional medical or physiotherapy advice. Always ask your GP if in doubt. The Plans are not appropriate for you if you have any of the conditions or illnesses listed in clause 7.2 below, or if you are under 18. 1.1	Who we are. We are Fiona Campbell, sole trader. 1.2	How to contact us. You can contact us by email to hello@fionanutrition.com or via the contact details on our Contact page. 2.1	All the meals contained within the Plan are pre-set and new recipes will not be created upon request. 2.2	It is important that you fully understand that the advice given by us is followed at your own risk and responsibility. This does not constitute medical advice and you must ensure that both you and your GP or physician are comfortable with the instructions included in The Plan. 3.1	We are the owner or the licensee of all intellectual property rights in our Plan. This work is protected by copyright laws and treaties around the world. All such rights are reserved. 3.2	You must not use any part of the content of the Plan for any purpose other than your personal health and nutrition. 4.2	We may ask your permission to publish the photos. We may contact you to ask permission to publish the photos. We will always do this in writing, and, if we get your express written approval, you grant us the right to publish those photos, share them with the public and use them in any way whatsoever, including commercial uses, in perpetuity. 5.1	When the contract for a purchase of a Plan comes in force. When you tick the box confirming that you accept these Terms of Business and complete your payment, you are making an offer to purchase the Plan. A legally binding contract is formed when we have sent you a confirmation email that your order has been accepted. 5.2	You must be in good health. You confirm that you are in good physical condition and know of no medical or other reason why you should not follow The Plan. 5.3	Our Plans are primarily aimed to customers in the UK. We reserve the right to reject any orders of Plans from outside the UK. If we do so, you will be given a full refund. 6.1	You have the right to end the contact in certain circumstances. However, these are subject to certain important exclusions, which are set out below. Please check these carefully. If you have just changed your mind about the Plan (Consumer Contracts Regulations 2013), you may be able to get a refund any time within 14 days of the order. If you are ill or injured and cannot complete a Plan, you may be able to get a full or partial refund upon our receipt of a valid medical report from your GP. 7.1	How to tell us about problems. If you have any questions or complaints about the Plan, please contact us by writing to us hello@fionanutrition.com or via the contact details on our Contact page. 7.2	Summary of your legal rights. We are under a legal duty to supply Plans that are in conformity with this contract. See the box below for a summary of your key legal rights in relation to the Plan. Nothing in these Terms of Business will affect your legal rights. 8.1	Ways to pay. Goods must be paid for in advance. Plans may be paid for by a one off payment. 8.2	Where to find the price for the Plan. The price of the Plan, which includes VAT, will be the price indicated on the order pages when you placed your order. We take all reasonable care to ensure that the price of the Plan advised to you is correct. However please see clause 8.5 for what happens if we discover an error in the price of the Plan you order. 8.3	What happens if we got the price wrong. It is always possible that, despite our best efforts, some of the Plans we sell may be incorrectly priced. We will normally check prices before accepting your order so that, where the Plan's correct price at your order date is less than our stated price at your order date, we will charge the lower amount. If the Plan's correct price at your order date is higher than the price stated to you, we will contact you for your instructions before we accept your order. 9.1	We do not provide medical advice. When following a health and nutrition plan you are doing so at your own risk, and you must take full responsibility for the effects on your body which you may experience along the way. 9.2	We are responsible to you for foreseeable loss and damage caused by us. If we fail to comply with these Terms of Business, we are responsible for loss or damage you suffer that is a foreseeable result of our breaking this contract or our failing to use reasonable care and skill, but we are not responsible for any loss or damage that is not foreseeable. Loss or damage is foreseeable if either it is obvious that it will happen or if, at the time the contract was made, both we and you knew it might happen, for example, if you discussed it with us during the sales process. 9.3	We do not exclude or limit in any way our liability to you where it would be unlawful to do so. This includes liability for death or personal injury caused by our negligence or the negligence of our employees, agents or subcontractors; for fraud or fraudulent misrepresentation; for breach of your legal rights in relation to the Plans; and for defective Plans under the Consumer Protection Act 1987. 9.4	If defective digital content which we have supplied damages a device or digital content belonging to you and this is caused by our failure to use reasonable care and skill we will either repair the damage or pay you compensation. However, we will not be liable for damage which you could have avoided by following our advice to apply an update offered to you free of charge or for damage which was caused by you failing to correctly follow installation instructions or to have in place the minimum system requirements advised by us. 9.5	We are not liable for business losses. We only supply the Plans for domestic and private use. If you use the Plans for any commercial, business or re-sale purpose we will have no liability to you for any loss of profit, loss of business, business interruption, or loss of business opportunity. 11.1	We may transfer this agreement to someone else. We may transfer our rights and obligations under these Terms of Business to another organisation. 11.2	You need our consent to transfer your rights to someone else. You may only transfer your rights or your obligations under these Terms of Business to another person if we agree to this in writing. 11.3	Nobody else has any rights under this contract. This contract is between you and us. No other person shall have any rights to enforce any of its terms. 11.4	If a court finds part of this contract illegal, the rest will continue in force. Each of the paragraphs of these terms operates separately. If any court or relevant authority decides that any of them are unlawful, the remaining paragraphs will remain in full force and effect. 11.5	Even if we delay in enforcing this contract, we can still enforce it later. If we do not insist immediately that you do anything you are required to do under these Terms of Business, or if we delay in taking steps against you in respect of your breaking this contract, that will not mean that you do not have to do those things and it will not prevent us taking steps against you at a later date. For example, if you miss a payment and we do not chase you but we continue to provide the Plans, we can still require you to make the payment at a later date. 11.6	Which laws apply to this contract and where you may bring legal proceedings. These Terms of Business are governed by English law and you can bring legal proceedings in respect of the Plans in the English courts. If you live in Scotland you can bring legal proceedings in respect of the Plans in either the Scottish or the English courts. If you live in Northern Ireland you can bring legal proceedings in respect of the Plans in either the Northern Irish or the English courts. The foregoing is subject to mandatory consumer protections which apply in your country, which may offer you additional rights. 11.7	Alternative dispute resolution is a process where an independent body considers the facts of a dispute and seeks to resolve it, without you having to go to court. If you are not happy with how we have handled any complaint, you may want to consider an alternative dispute resolution provider. In addition, please note that disputes may be submitted for online resolution to the European Commission Online Dispute Resolution platform. The New Nordic Recommendations have also suggested that supplements may be used, to make sure that you are getting all the nutrients you need to meet the additional lifestyle demands of today. You'll find my commonly suggested supplements further on. Of course, your nutrient requirements are unique, so if you're keen to take it one step further you can always book an appointment with me.